Cork City Council, the Cork ETB, Sports Partnership and Sport Ireland are organising a 5k Fun Run on April 10th. It’s part of a programme of events and activities to support youth workers and community groups to achieve better health outcomes for young people. For further information, please contact the Cork Sports Partnership on 021-4347096 or email churley@corksports.ie. What is the Youth Challenge? The Cork Youth Challenge takes place within the main Team Relay as part of marathon race day. It’s for 16 to 18-year olds, but if needs be, an adult can run as part of the team. 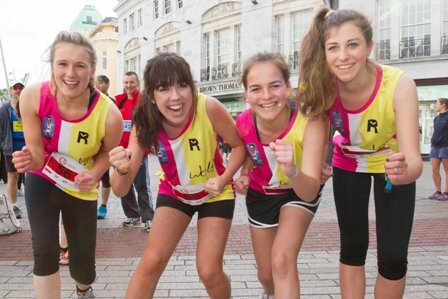 It IS an opportunity for young people over 16 years of age to be part of the Cork City Marathon Team Relay. It’s fun, it’s challenging and it promotes fitness, activity, participation and mental health. Teams of 5 complete the marathon course as a relay, taking a stage each and completing a maximum of 5.8 miles/9.3km. Each team will be led by a Challenge Leader, who must be over 18 on race day. The team leader doesn’t have to run as part of the team but can do so if desired. To enter, download the Youth Challenge entry form 2019 (PDF) and fill in the details of your team. The team leader (or manager) must be over 18 on race day and willing to be responsible for the team. In addition to the entry form, each member aged 16 or 17 must complete a Youth Challenge declaration form 2019. Once you’ve completed the entry form and gathered all the personal declaration forms, post them back to Event Manager, Cork City Marathon, City Hall, Cork. If you’ve given us an email address on the form, you’ll receive confirmation of your entry by email as soon as we process it. The Youth Challenge is for youths between the ages of 16 and 18. All participants must be 16 years or older on race day. Teams must have an adult – over the age of 18 – as the Challenge Leader. The Leader does not have to run but will be the point of contact for the marathon office. On Race Day, the Leader, should be available by phone in case of need. The first participant from each team starts the marathon and completes his/her leg before handing over to a team-mate at the relay changeover points. Teams will be issued with a team wristband in their team pack at registration. The wristband must be handed over to their team mate at each changeover point. The distance between each changeover point ranges from just over 4.5 miles (7.2km) to just over 5.8 miles (9.3km). Download How the Relay Works for details on the stages. You’ll get more information on the relay here. Shuttle buses will operate on race day to carry participants to the changeover points. The finishing member of each team will wear a timing chip, which will give the team’s official time. Youth Challenge Participants must be 16 years of age or over on 2nd June 2019. Each under-18 participant and their parent or guardian must sign the personal declaration form which must accompany the entry form. The closing date for entries is Friday 17th May 2019. Entries for the Youth Challenge will only be accepted in hardcopy format. Each entry form must be accompanied by the team’s fee of €75. When we process your entry, we’ll post you out a confirmation of entry form. Please keep the form safe and bring it with you to registration. 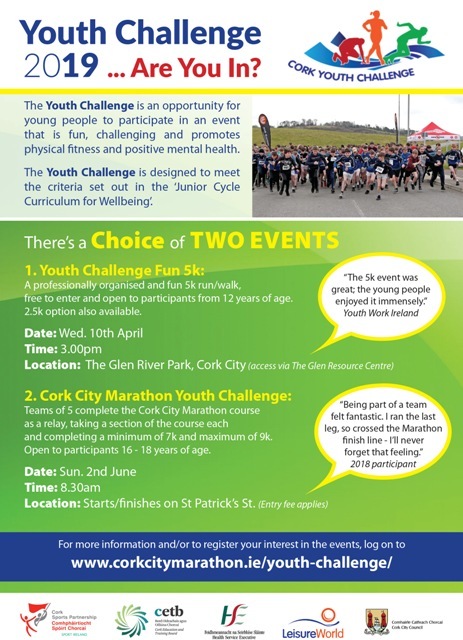 At least one member of each Youth Challenge team must register at Cork City Hall on either Thursday 30th May (4-7.30pm) or Saturday 1st June (10am – 8pm) to collect your timing chip, race numbers and goody bag. These cannot be posted out to you. It is strongly recommended that you consult your doctor if you have any doubt about your health or fitness level. If you’re already following a programme that works for you, stick with it. If you’re not, you might want to check out our options here, with thanks to LeisureWorld Cork. They’re 12-week programmes but you can tailor them to suit you and your team mates’ level of experience.